This book comprehensively outlines and evaluates the key Obama nuclear weapons policies, developments and initiatives from 2008–2012. 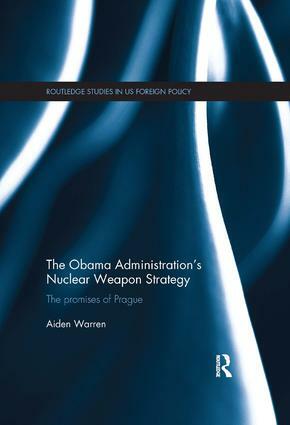 Beginning with the administration’s vision and goals posited in the 2009 Prague Speech and reaffirmed in the National Security Strategy of 2010, the book assesses the congressionally mandated Nuclear Posture Review, the New START Treaty, the pursuit of Comprehensive Nuclear-Test-Ban Treaty ratification, the Proliferation Security Initiative, the Fissile Material Cut-off Treaty, the Nuclear Non-Proliferation Review Conference, the Global Nuclear Security Summit – and the extent to which Obama, in the context of such initiatives, has actually upheld the lofty goals posited in Prague and differentiated himself from the nuclear path pursued by the Bush Administration. Additionally, the book evaluates the Obama Administration’s dealings with other states in the context of its nuclear weapons policy – in particular, North Korea, Iran, Pakistan, Israel, India, and China. Offering a comprehensive analysis of the current status of the US nuclear weapons strategy, this volume will be of great interest to scholars and students of American foreign policy, security studies and international relations.